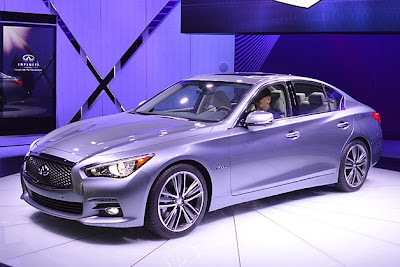 Debuting at the 2013 North American International Auto Show, the new replacement model for the Infiniti G sedan, the luxury Infiniti Q50 sports sedan could be forgiven for being a little underwhelming at first sight. It is the first Hybrid car produced by the Nissan owned Infiniti manufacturer and follows the design of the Infiniti Essence concept first revealed back in 2009. With the base model priced at $36,450 (around £23,863), the Infiniti Q50 has some stiff competition in the luxury sedan marketplace. The ever popular BMW 3 Series and Audi A4 range both start at around the same price, with a Mercedes C-Class and Lexus’ new IS model both within easy reach of this price bracket. The new Q50 model however does have some advantages over its competition. Offered with either a 3.6-litre V6 engine or Infiniti’s new 3.5-litre Infiniti Direct Response Hybrid both with either rear-wheel or all-wheel drive, power, luxury and economy are all big selling points for the new model. What are your thoughts on this new model from Infiniti? Can it break this growing marketplace?